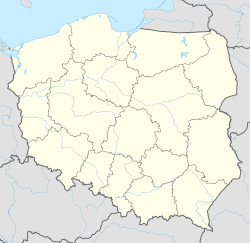 For other places with the same name, see Wyszków (disambiguation). 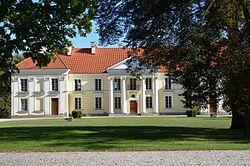 Wyszków ([ˈvɨʂkuf]; Yiddish: ווישקאָוו‎ Vishkov) is a city in Poland with 26,500 inhabitants (2018). It is the capital of Wyszków County (Polish: powiat wyszkowski). Wyszków is in Mazowsze Province (since 1999); previously it was in Warsaw Province (until 1975) and Ostrołęka Province (1975–1998). The village of Wyszków was first documented in 1203. The town was founded in 1502. It was destroyed during the Second Northern War in 1655-1660, when it lost its significance in the region. Industry developed after 1897, when the Pilawa-Tluszcz-Ostrołęka railway was built..
Before World War II half of Wyszków's population of 9,000 were Jewish; after the war there were none. On 14 September 1997 a memorial to Holocaust victims was unveiled in Wyszków. It is made of reclaimed Jewish gravestones that had been removed from the site in 1939 by German forces, who used them as paving stones and to build the local Gestapo headquarters. Scores of these desecrated tombstones were recovered and incorporated as part of the monument. Wyszków was the birthplace of Mordechaj Anielewicz in 1919. ^ "Välissuhted" (in Estonian). Kohtla-Järve linn. Retrieved 1 March 2012. Wikimedia Commons has media related to Wyszków. This Masovian Voivodeship location article is a stub. You can help Wikipedia by expanding it. This page was last edited on 27 February 2019, at 03:13 (UTC).